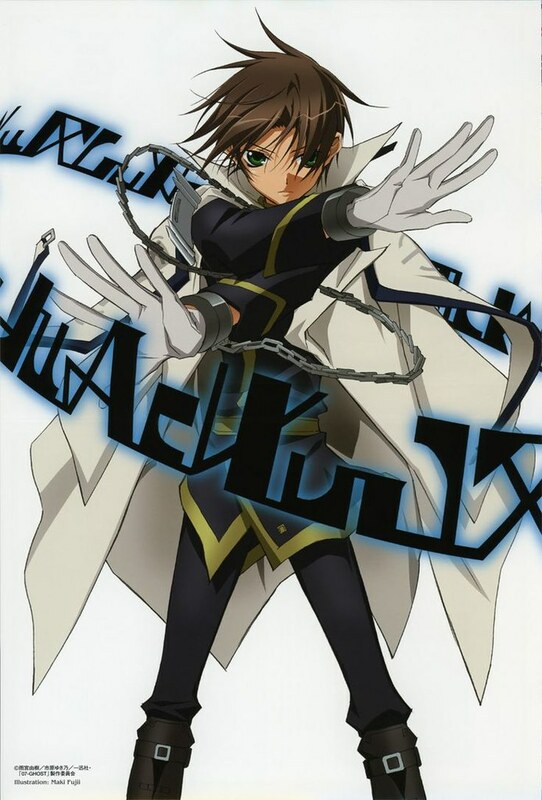 Teito Klein is a former slave who now attends the Barsburg Empire’s military academy due to his ability to use Zaiphon, a type of supernatural power. The ability is rare and thus highly prized. Teito is an amnesiac who frequently has frightening dreams. 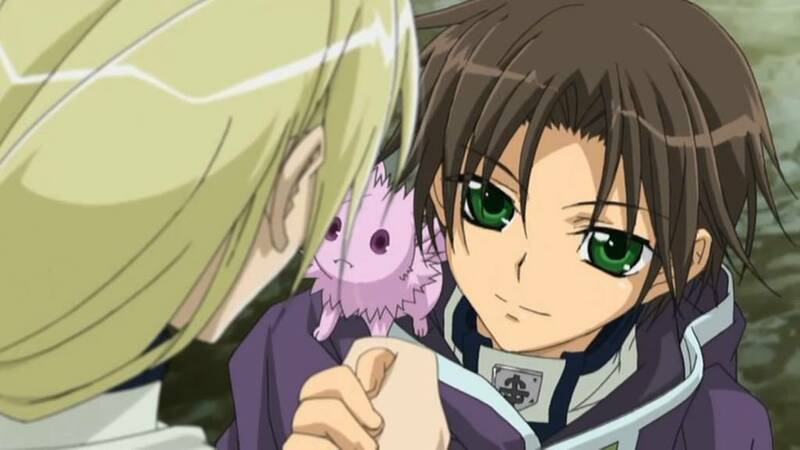 The night before the graduation exam, Teito and his only friend, Mikage, vow they will never abandon each other. The next day, Teito overhears people talking about him. Stopping to listen, he suddenly realises that the speaker, Chief of Staff Ayanami, is the person who killed the familiar man in his dreams: his father, the king of the destroyed Raggs Kingdom. Teito is caught eavesdropping and tries to attack Ayanami but is quickly brought down by one of his subordinates and sent to prison. Mikage comes to help him escape, only to find that Teito has managed to fight past the guards by himself. The two flee the building but are cornered on a balcony. 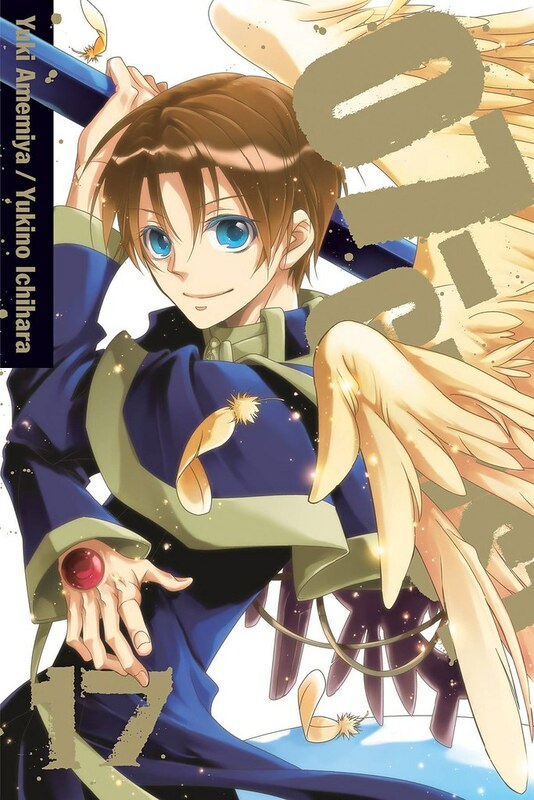 Teito pretends to hold Mikage hostage, then makes his escape, though he is wounded by a Zaiphon blast that Ayanami directs at him. Three bishops in the nearby 7th District discover the injured Teito and take him to a nearby church to recuperate, where he is protected because of the 7th District’s law of sanctuary. The first time I know about 07 Ghost is by accident. I mean, I was a little bored and changing my channel on television when I stopped at Animax and watch 07 Ghost. The anime only has 25 episodes and the story is still yet to finish. There are so many unanswered questions and that is why I decided to read the manga. I actually have read the manga years ago, but I kind of reread it again and decided to give it a review. 07 Ghost indeed has a very interesting story. Basically, it’s about the shinigami or in English, we called it God of Death, named Verloren, who is sealed by the Seven Ghosts, who are created by the Chief of Heaven to punish Verloren. These Ghosts are pretty much very powerful. Each of them has a specific power. Zehel (斬魂), the Cutting Spirit, can sever bonds; Fest (繋魂), the Tying Spirit, can bind souls together; Profe (言魂), the Speaking Spirit, prophecies; Reliquie (can be also written as “Relikt”) (遺魂), the Bequeathing Spirit, can see one’s past; Vertrag (契魂), the Pledging Spirit, can manipulate souls; Landkarte (消魂), the Extinguishing Spirit, can send something or himself away to a certain place; and Ea (醒魂), the Awaking Spirit, can assign numbers to every soul in the world and determines their destination after death and also hold the Book of Hades. If every ghost’s power is combined, they’ve become Verloren’s power. And because Verloren is believed to kill the Chief of Heaven’s daughter, he was punished and sealed in Pandora’s Box. All the Seven Ghosts are embodied in humans with extraordinary Zaiphon. which was originally the fragments of Verloren. They were sent down to the earth by the Chief of Heaven in order to stop Verloren. They have the mark of their Ghosts on their hands (each Ghost has different mark). The scythe of each Ghost also has their own marks at the end. Eye of Mikhail, which has been used to seal Verloren’s original body in Pandora Box, while the Eye of Raphael forces Verloren’s soul to be reincarnated in human bodies and keep his memory sealed. Eye of Raphael is kept in Barsburg kingdom, while Eye of Mikhail is kept in Raggs kingdom. Teito Klein is the boy who bears the Eye of Mikhail and the story of 07 Ghost is basically about him as the bearer. There are people that wanted to possess the power of the Eye of Mikhail and that’s why the Empire’s military academy tried to recruit many children that can bear the eye. 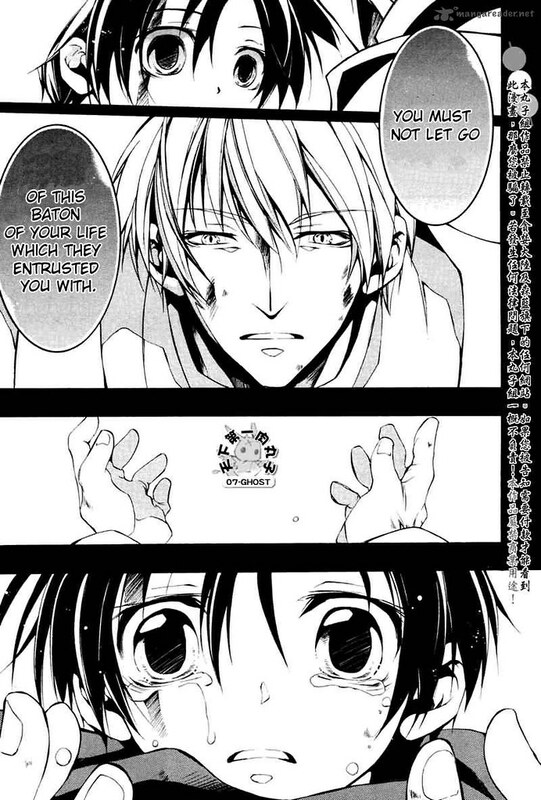 After knowing Teito has the Eye of Mikhail, Chief of Staff Ayanami always tried to capture him together with the eye. 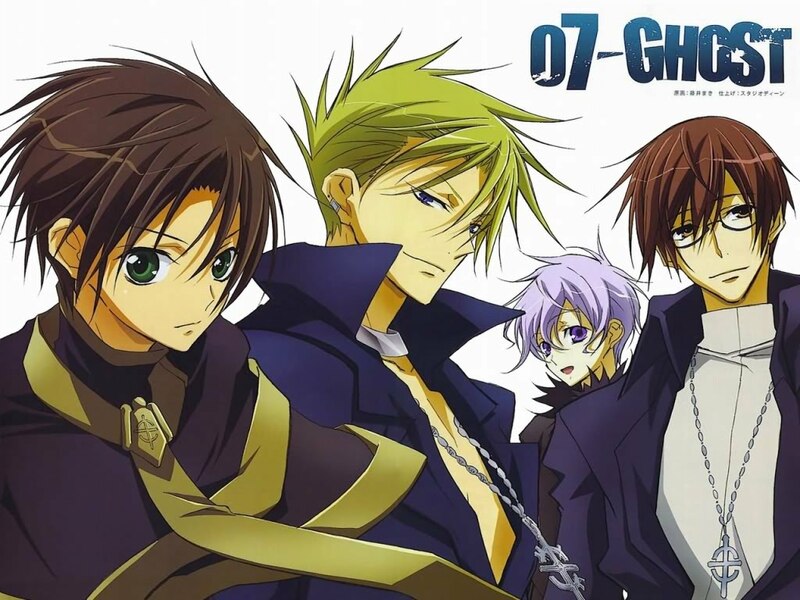 Teito managed to escape the military academy and met three bishops; Frau, Castor, and Labrador; who apparently are the three ghosts Zehel, Fest, and Profe. I always find it interesting when a film, a book, or anything, that takes the story about angels, or grim reaper, or any supernatural beings like this manga. The concept of the Seven Ghosts are very interesting, plus the power of the Eye of Mikhail is also very exciting. The background story of Verloren and the Chief of Heaven’s daughter, Eve, is interesting to see though it wasn’t told until nearly the end. Since I am a fan of fantasy, I always find this kind of story really interesting. Plus, 07 Ghost also includes the story of angels and grim reapers. Somehow it makes this manga even more exciting. The action is thrilling and we would see a new type of magic here. They called it as Zaiphon. There are three types of Zaiphon; offensive, healing, and manipulation. Some people can do offensive and healing but most people can only do one type. Not only the fantasy, the story itself is already thrilling. It is simple yet somehow complicated and dark. I can’t stop reading once I started reading the manga. Yes, it is that interesting. 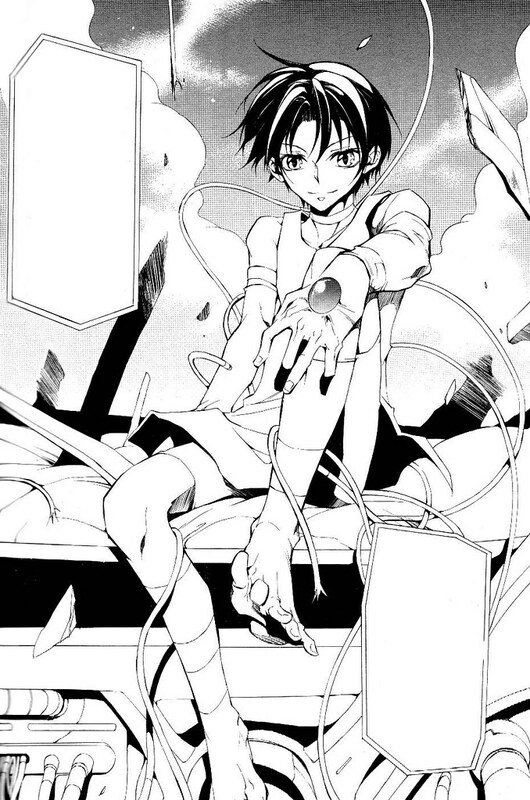 However, the highlight of this manga is, of course, Teito Klein. Despite his serious face and character, he can also be funny sometimes. The relationship between him and Frau is the combination of cute, funny, and sweet. 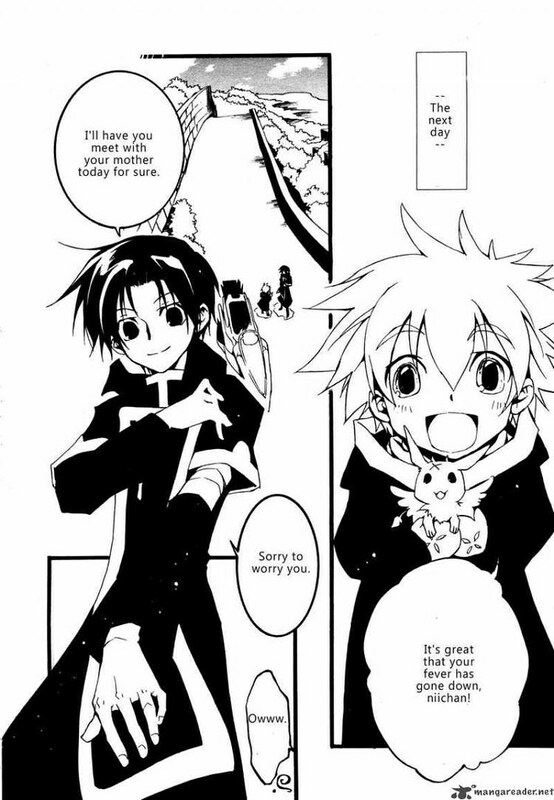 I laugh a lot when Teito is being together with Bishop Frau, not just in the anime but also when I read the manga. The interaction between the bishop and his apprentice is really great. 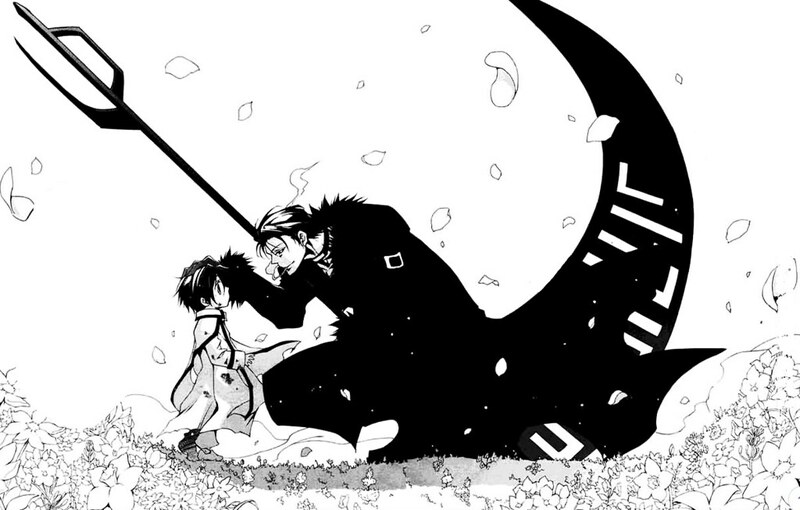 Not only with Frau, Teito also has interesting relationships with other characters as well, like with Castor, Labrador, the mermaid Razette, Hakuren, Capella, and Hakuren. 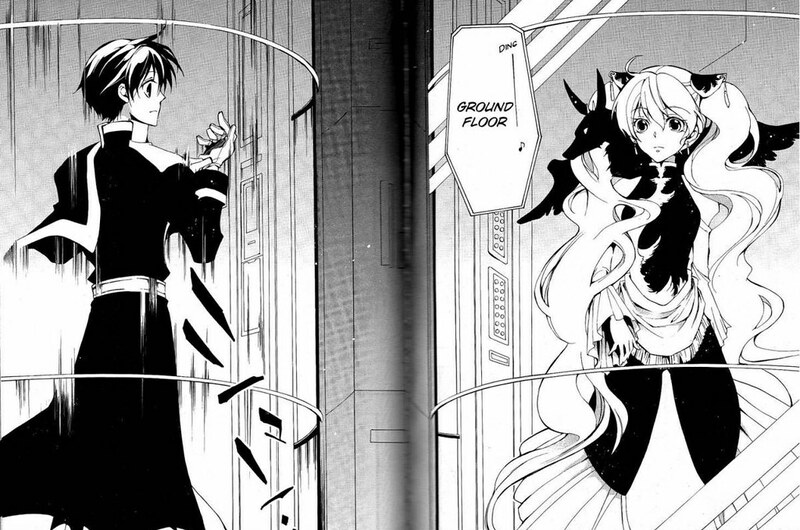 Although the funniest is always when Teito is with Frau. 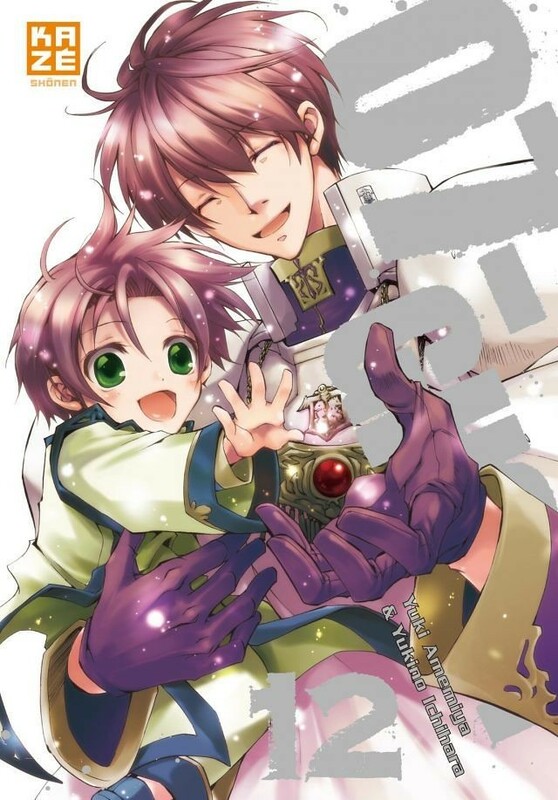 The cute little Fyulong that was always with Teito is really adorable too. 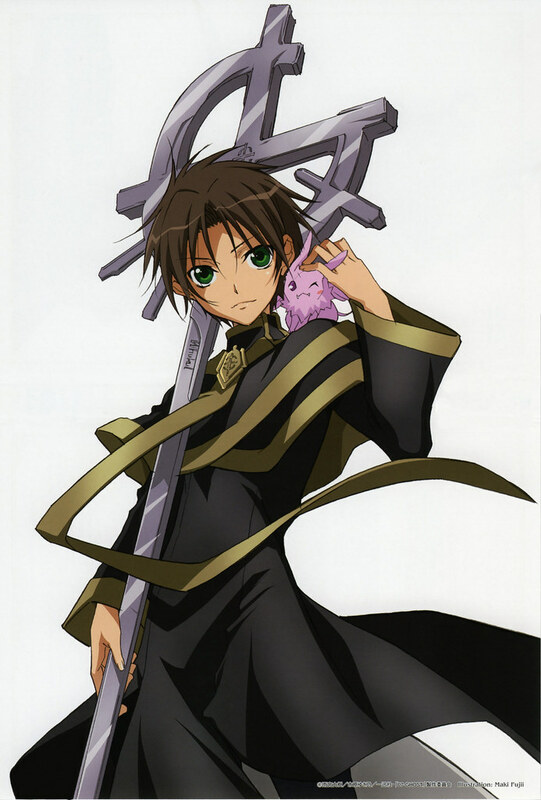 Teito named him Mikage, from his best friend’s name in the military academy. In the manga, you won’t know how he sounds, but seriously, if you watch the anime, he sounds utterly cute. I wish there was a pet like Teito’s Fyulong because seriously, who doesn’t want it? It’s super adorable. 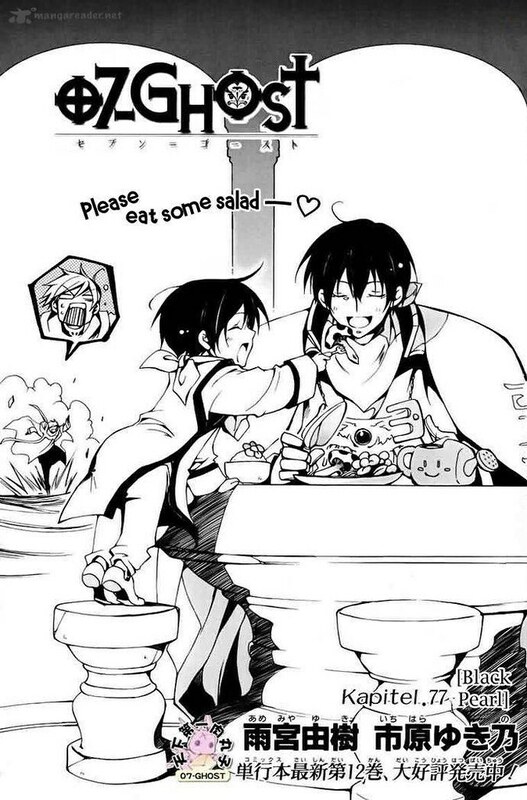 So, it’s not only with the human characters, Teito managed to interact with the Fyulong as well. Even with the Eye of Mikhail, the interaction can be very funny too. I like it when the Eye of Mikhail is active. In the anime, Teito’s eyes will turn into red colour. Even though there’s no colour in the manga, Teito’s kind eyes will be replaced with more cool and fierce eyes. Ouka, the girl who bears the Eye of Raphael also has a Fyulong named Kururu. Kururu is bigger than Mikage, and the colour is also different. But I prefer Mikage. Perhaps because Mikage is smaller and cuter. Nevertheless, you just can’t deny that the Fyulongs are cute. You’ll wish you can have that kind of pet. It’ll be more exciting than having a normal dog or cat, right? Even though dogs and cats are cute too. What I like about 07 Ghost aside from its interesting story are the drawings. Amemiya Yuki and Ichihara Yukino managed to draw all the characters very beautifully. I love every single character in 07 Ghost. 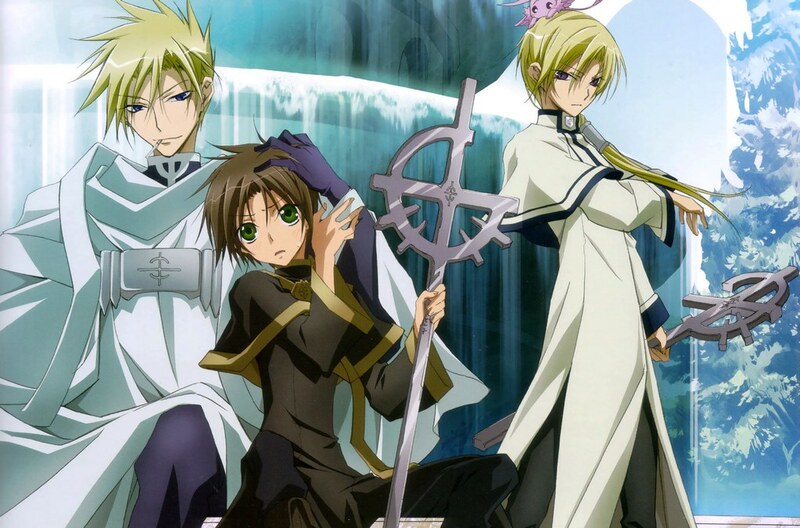 Teito was drawn really cool and handsome, all the bishops also look very cool and handsome as well. Teito looks even cooler when the Eye of Mikhail is active. Mostly the characters are male but when there’s a female like Ouka and Eve, the authors even drew them very beautiful as well. Razette, the noel mermaid, is also very beautiful. What’s funny about her is that she can change her face into someone else. Though she doesn’t talk, she can be funny too. Especially when she changed her face into Frau that would make Teito stunned. It’s really funny indeed. Aside from the characters, the clothing in 07 Ghost is unique. It’s not the usual attire. The bishops’ clothes, the students’ uniform in the military academy, and the royalty’s attire are all very unique and beautiful as well. Since the drawings are already beautiful, it’s no surprised that the clothes are drawn beautiful. I have always loved manga or anime with beautiful clothes. Like in Vampire Knight for example. They have beautiful uniforms in that manga and anime too. Not only the clothes that are unique, in 07 Ghost, the names are also very unique. I guess they sound like German or Dutch, I don’t know. But I definitely like the name of Verloren. And then there’s also Wahrheit Tiashe Raggs and Roseamanelle Ouka Barsburg. Those names are the example of how unique the name of the characters in 07 Ghost. The names are not like the usual names in any manga or anime. Perhaps because it was adapted from German. Even Teito Klein himself is not a usual name in Japanese, right? Or perhaps I’m wrong? Please do correct me if I’m wrong. And then there’s also the moral lessons in the story. There are so many words that I would like to quote because they are so meaningful. It’s kind of a life lesson as well. So yes, it’s not just about the story. It’s also the moral lesson that we can learn from the manga. 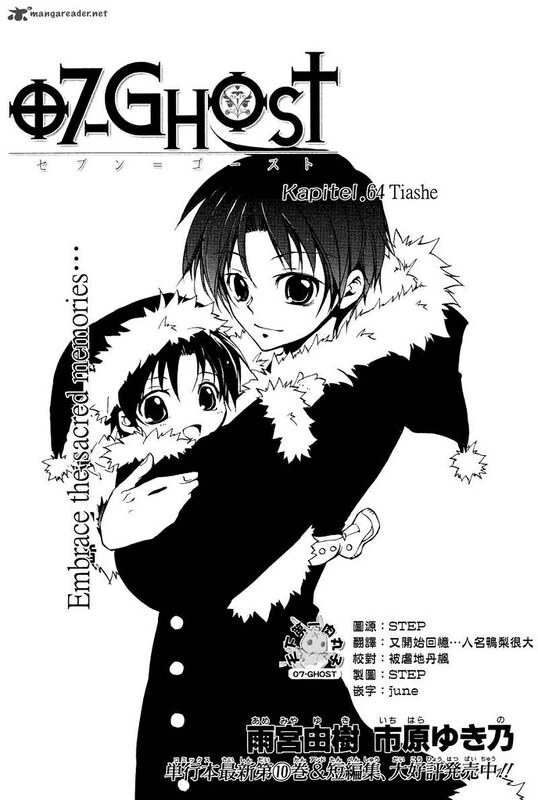 I love Teito when he was a young kid. He is super uber cute! Seriously. The character of Capella, a slave boy that Teito and Frau found during their journey, is also very cute. Surely, the authors really did a great job in drawing the manga. Not only the older men look very handsome and cool, the girls are also very beautiful, and the children are very cute too. Even the villains are also very handsome too. Good drawings will surely make someone read the manga more enthusiastic. However, it all comes back to the story as well and 07 Ghost do have an interesting and exciting story with great drawings that support it, adding some plus points on the manga. Overall, I really love 07 Ghost. The manga is really enjoyable to read. Plus the drawings are excellent and therefore made the reading experience more enjoyable and fun. The story is easy to understand even though there is so much going on. It’s funny, it’s thrilling, it’s interesting, and it’s exciting. I really like the idea of the story. Making the angels and the grim reapers into a new fantasy world of its own. The drawings of this manga are also great. It’s more than just fine, actually. It’s perfect. The attire worn by all the characters are unique like none other. Even the name of the characters and the places are also unique, not like the usual names in any manga. I give 07 Ghost 4.5 out of 5 stars. I really love this manga!